Lexi ends up wanting to cause Reece the same pain he caused her so she was originally going to wipe out his entire pack. But then changes to where she wants him made into a hybrid like her and he can suffer the same fate as her. When she became the hybrid, she became emotionless and didn’t care about anything. Only her plan backfired on her. He wasn’t emotionless. Instead he felt it all. He admits to Lexi that he wasn’t in control of his mind and that he really did love her. Only she doesn’t believe him. Things are strained between them. They end up following Katrina to take out a rival vampire nest only it turns out to be Mark, Kala, Flynn, Phillip and a Necromancer. Katrina and her nest, minus Lexi and Reece are killed. 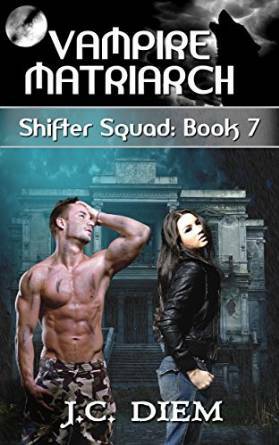 Lexi and Reece are kidnapped by a woman clad in leather who we later learn was a champion of Fate’s in another version of Earth who had been sent there to talk to Reece and Lexi. She lets Lexi into Reece’s memories and Lexi gets a glimpse of a reason why Reece didn’t want to get too close to her. This story was a good one to read. Fate has been brought into it and this is definitely going to be getting much better as the series goes. I can’t wait until the 8th book comes out and I can read it as well. Reece is back in my good graces after this book but Lexi remains my favorite character. I like the introduction of one of the new people….the others I’m not so sure about. 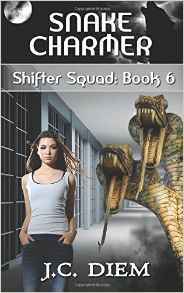 Snake Charmer is the sixth book in the Shifter Squad series by author J.C. Diem. We know that in the last book that Lexi had transformed into her wolf self and took off out of the compound. She was unable to deal with the pain of Garrett/Reece rejecting her for his true, full=blooded wolfshifter mate. She ends up in the wild in her wolf form for close to a month before Zeus shows up in the cave she’s been staying in after killing the bear who had been inhibiting it. She steals their truck and ends up getting Zeus to a vet. While there, she ends up being detained by a couple deputies and is held until the sherriff gets there. He doesn’t like her story so she ends up behind bars. The sheriff refuses to let her make a call but it’s not necessary once Mark walks into the police station. He takes over “custody” of Lexi, even though she had given a fake name. They stop and pick Zeus up and then head back to the compound in Colorado. That’s when they learn of a new case involving snakes biting people in the neck after these world’s deadliest snakes had gone missing from a snake park in Texas. They head to Texas and it’s not long before Flynn goes missing when they’re checking out a farm! 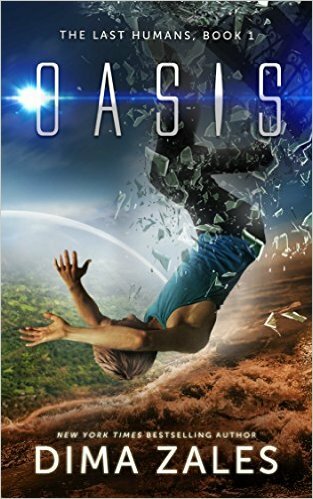 Amazon Description: My name is Theo, and I’m a resident of Oasis, the last habitable area on Earth. It’s meant to be a paradise, a place where we are all content. Vulgarity, violence, insanity, and other ills are but a distant memory, and even death no longer plagues us. Note: This book contains some strong language. We felt it was important for the censorship theme of the novel. If such words offend you, you might not enjoy this book. I knew from the opening of this book that I was going to like it. And I did. This new post-apocalyptic/dystopian book was a great read. 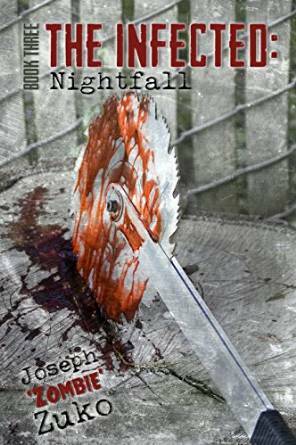 I couldn’t put it down once I started reading it and read it until a little after 3 am because I was hooked. I like Theo the most out of all the characters. Theo is a Youth. Then there are Adults and Elderly. They live in Oasis which is the last habitable part on Earth. There’s a place called the Edge that separates Oasis from the Goo, the uninhabitable part of the world. Everything inside the Institute is monitored. Phoe, Theo’s imaginary friend, tells Theo things that an imaginary friend shouldn’t know. So is she real or not? That’s what Theo wants to find out and why she is HIS imaginary friend. 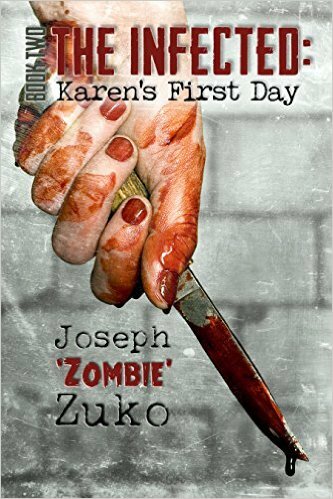 This is the second book in the Infected series by author Joseph Zuko. In this book we follow Karen, Jim’s wife. Karen is at home with the girls when she gets freaked out. She ends up leaving the apartment after a hellish day with her brother, Troy. They end up at a police station with one officer and one convict inside. They end up releasing the convict, Leon, in exchange for his help. He’s more of a help than they had planned on. He ends up getting them a car and helping with the girls. Then when Troy is taken out of commission, he helps to save him, Karen and the girls. He’s really starting to fall for Karen which could be an issue if her husband ends up being alive but he’ll worry about that later. They make it to her mothers house to find her mother dead in the back yard. A salesman had killed her. This was a good sequel to go along with the first book. I like that this book follows Karen and now we’re on even footing with knowing how Jim and Karen’s first days went. This book was easy to read and had me enthralled while reading it. Book four sees Alexi, Kain and Sophie in a little village. They arrive there and talk to a priest, a shaman and done of the Alluring Ones. Tengu goes back to the Academy and chooses demon’s that Alexi and Kain can mimic in their human forms in order to stay close to Sophie so if something happens. Sophie is hired by the Count to come and entertain him and his friends. Although it looks like he takes a liking to her right from the start. He doesn’t send her to work in the kitchens or the grounds. Sophie stumbles upon an ancient creature and is almost injured before the Count returns and orders the creature to stop the attack. They return to the house and she sends a message to the two boys with only two words and they manage to decipher what she means even though they’re irritated she was so cryptic. I like this book. The story is getting better as it goes. I can’t wait to find out what plan Alexi and Kain come up with to deal with the ancient creature and the fate of the Count as well. Sophie is still my favorite character and Kain is fast approaching the second favorite character slot. Sophie, Kain and Alexi return in the third installment of the Lure Academy series by Cara Wylde. This book sees them having more training sessions. Sophie is shocked when she’s called to the therapists office. There she learns that Kain and Alexi think she’s ready to start training on the demon prisoners. She thinks she’s ready so she goes along with it. Turns out, she’s more than ready. Immobilizing a demon and draining his power in a few seconds when it takes more experiences people longer than that. At the end of the second book, we learn of a possible ke’let demon. In this book, the ke’let demon is confirmed. Kain and Alexi are pulled into Lilith’s office and she wants them to work the case and to choose one female cambion to accompany them. They choose Sophie since she’s the one that balances them out but Lilith is skeptical to send her at first but finally agrees. What dangers lie ahead for the trio? This book is steamier than the previous two books! The physical action is getting bolder by the book and I can’t wait to see what’s in store for book 4! I like that Sophie is portrayed as a normal girl except with these special abilities. I’m not sure what to think on the ending of the book. I hope that more is uncovered in the coming books! Two Legends is the second book in the Lure Academy series by Cara Wylde. Alexi, Kain and Sophie return in the second installment of the Lure Academy series. Their first session was a complete bust. Kain finds out that Alexi had the files from his cases and wasn’t happy about it. Alexi learns more about Kain than Kain ever wanted known by anyone. They talk and end up coming to agreeable terms. They ends up in the Red Chamber with each other and man is it hot!! Sophie ends up seeing them together and then starts having doubts. They used her to start working with each other. They were too proud to admit to each other they like the other. They couldn’t help her now. She wasn’t attractive enough for them. They were legends and she’s a lowly cambion who knew nothing. So she goes to tell them that she made a huge mistake but things turn out way differently than she had planned. Oh my! This book is hotter than the first. You’ll be left needing a seriously cold shower in order to combat all the hotness in this second book. I’m liking Sophie more and more. She seems like a normal everyday girl with her insecurities and everything. Alexi and Kain are growing on me more. A few spelling/word errors but nothing major. Definitely still loving her books.